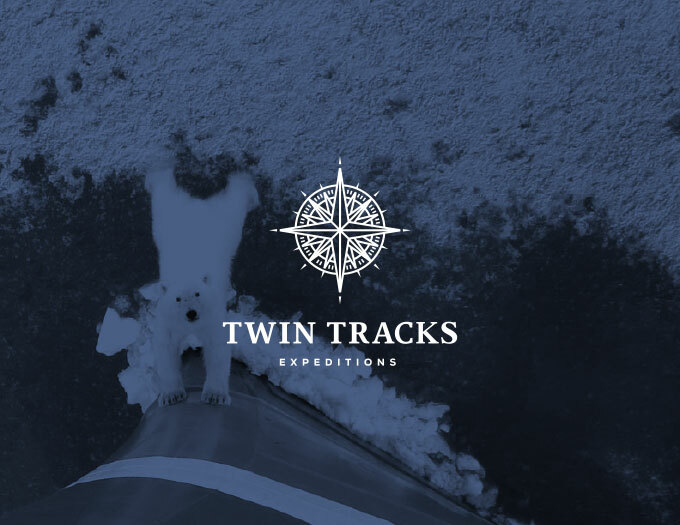 Offering bespoke adventure cruises to the polar regions, Twin Tracks is founded and operated by Swiss twin brothers, Dave and Rickard (and Rickard’s wife and coach-turned-friend-turned-client, Heather). Sailors at heart with a love for all things nautical, they’re taking their first-hand knowledge and experience as expeditioners and creating unique, custom adventures for others. Appealing to an affluent customer, Twin Tracks provides high touch, personalized, attentive service and planning, to provide a truly once in a lifetime. For their brand, Dave and Rickard wanted an identity that was representative of the sophisticated and luxurious experience the company provides, and also one that told their love story of seafaring. More importantly, they needed it to maintain a level of professionalism that appealed to their clients and set them apart from other polar cruise operators. To achieve that, a classic, high-end mark, color scheme, and typographic presence with a mix of old and new elements was developed. It establishes the brand as one to take seriously and provides flexibility that Twin Tracks can grow with. Need some help bringing your brand to life? Let’s connect! Morgan is like a branding ninja-angel who can somehow magically mind-meld with your creative vision and come up with gorgeous brand elements that are even better than what you’d imagined. I came to her for a logo and walked away with SO MUCH MORE … a partner in brand-building. She gets it. She sees things you don’t. Working with her helps you level up and bring it even more and in a way that makes you believe you’ll be a success before you even open the gates.